Dramatic volcanic eruption in Chile Jump to media player The Villarrica volcano in southern Chile has erupted, spewing ash and lava up to 1,000m (3,300ft) into the air. 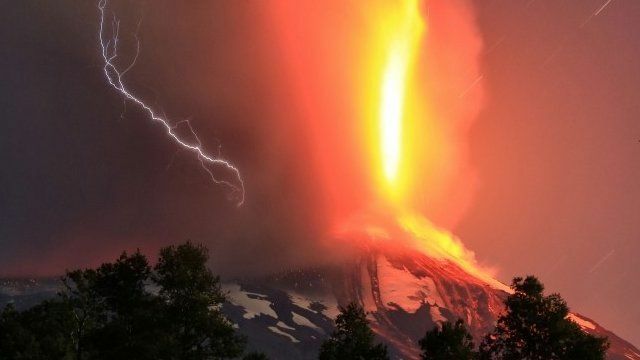 Volcano eruption puts Chile on alert Jump to media player The Villarrica volcano in southern Chile has been throwing out jets of lava from its crater, putting the town of Pucon on high alert. Footage of Mexico volcano erupting Jump to media player Mexico's Colima Volcano, also known as the Fire Volcano, erupted again on Sunday. Timelapse film of volcano eruption Jump to media player This amazing timelapse footage shows the Colima volcano in Mexico erupting. Slow moving lava creeps along road Jump to media player The lava flow from the Kilauea volcano is slowly crawling towards the village of Pahoa and officials have said the first house has been hit. Lava field 'bigger than Manhattan' Jump to media player A volcano in Iceland has produced a river of molten rock that could cover the entire island of Manhattan in the United States. Volcano erupts on Cape Verde island Jump to media player A volcano has erupted on the Cape Verde island of Fogo, resulting in the evacuation of hundreds of residents and the closure of a local airport. The Villarrica volcano in southern Chile has erupted, spewing ash and lava up to 1,000m (3,300ft) into the air. More than 3,000 people were evacuated from the volcano's vicinity. The mayor of the nearby town of Pucon said residents had left "calmly".